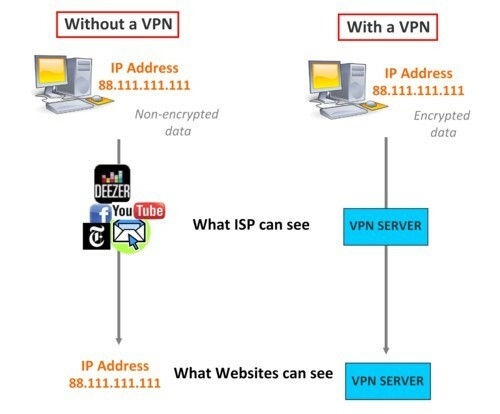 On this page, we are going to try to define VPN and to explain why it is the best solution to protect your privacy and have a secure connection. A Web proxy can also fulfill these objectives, but they are, according to us, less efficient. If you want to know the differences between Proxy and VPN, go on our Proxy/VPN comparison page. VPN means Virtual Private Network. When you browse the Internet, when you send E-mails or when your share files, you generate traffic on a common virtual network. You can’t leave this network without a trace. These information you send can be easily intercepted and pirated. First a VPN conceals these information through the system of encryption: there can’t be read by other agents like your Internet Service Provider (ISP) or websites in general. The encryption can be made in accordance with different protocols (PPTP, OpenVPN, IPSec,..). Secondly it will build a private tunnel, a closed link between the client using the VPN and the VPN server. That’s why a VPN service always need a user and a provider: that’s a trade and authentification system between the two agents. A VPN creates a secured Internet connection which does not allow your ISP and other websites to see what you are doing. They only see encrypted data and the location of your VPN provider. Your VPN server gives you a new anonymous IP address among all the adresses it detains. On the Web, IP address is the only way to identify the transmitter and where he is located; with a VPN, it’s always the IP address of the server which is found. So we have no mean to know who is the user: hackers are “stopped” by the VPN server. There are many servers which provide this service. The most popular are Astrill, Hidemyass, VyprVPN, Overplay, VPN Worldwide, ExpressVPN, StrongVPN et TuVPN. we can have secured exchanges in a closed network. This can be useful for big companies having services all around the world: because of the distance, they must communicate via Internet, but they need this communication to be as private and reliable as possible.